Florida Gov. 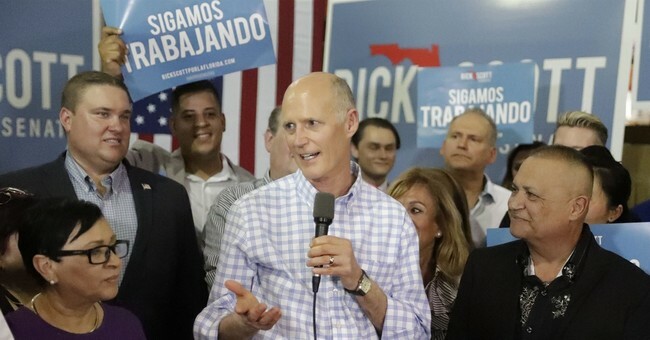 Rick Scott’s Senate campaign filed emergency motions Sunday to have the election equipment used in Broward and Palm Beach Counties impounded and secured by the Florida Department of Law Enforcement and sheriff’s deputies when votes are not in the process of being counted. JUST IN — Republican Rick Scott’s senate campaign filed motions in Broward & Palm Beach Counties, FL, to impound ballots & tallying machines when not in use until recount/lawsuits are done — putting them under police oversight. “As long as the Supervisor of Elections has unsupervised, unaccountable, and unfettered access to the ballot boxes, she will be able to destroy evidence of any errors, accidents, or unlawful conduct — making it nearly impossible for an aggrieved party to prosecute their claims or discover later what has occurred in the electoral process,” the complaint states. The requests follow what the team calls the "continued antics, failures and willful disregard of the law by Broward County Supervisor of Elections Brenda Snipes and Palm Beach County Supervisor of Elections Susan Bucher." The complaints also request that both supervisors be ordered to preserve all ballots and records connected with the 2018 election. Scott’s opponent, Democratic Sen. Bill Nelson, responded, calling the move an effort "to stop every legal vote from being counted." "He's doing this for the same reason he's been making false and panicked claims about voter fraud -- he's worried that when all the votes are counted he'll lose this election," his statement said. "We will not allow him to undermine the democratic process and will use every legal tool available to protect the rights of Florida voters." The Florida Democratic Party went so far as to say Scott was behaving like a Latin American dictator. Somebody needs to cut down on the Red Bull.